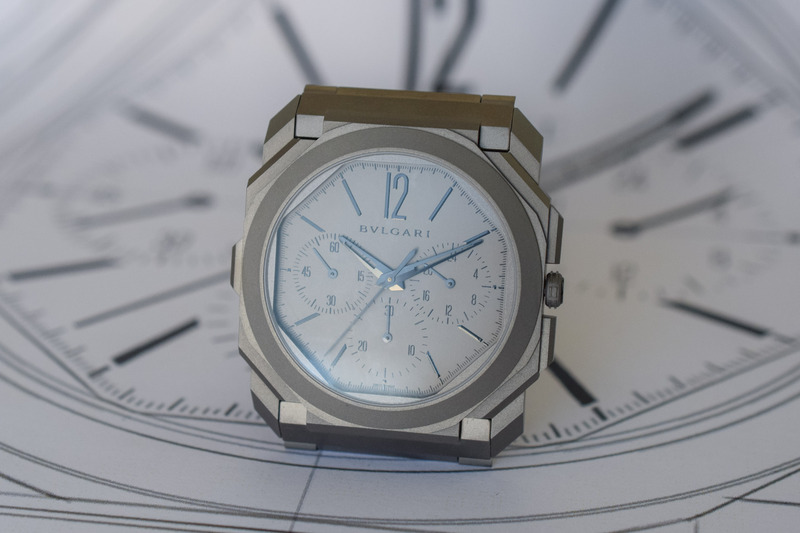 Bvlgari earns its fifth record in the ultra-thin arena with the thinnest chronograph watch in the world. With no fewer than four world record for thinness under its belt, we thought that Bvlgari was going to settle down and enjoy its recognition as the ultimate master of ultra-thin… But we were wrong! Until now, the title for the thinnest chronograph watch (understand mechanical, of course) was in the hands of Piaget, with this 8.24mm thick watch. 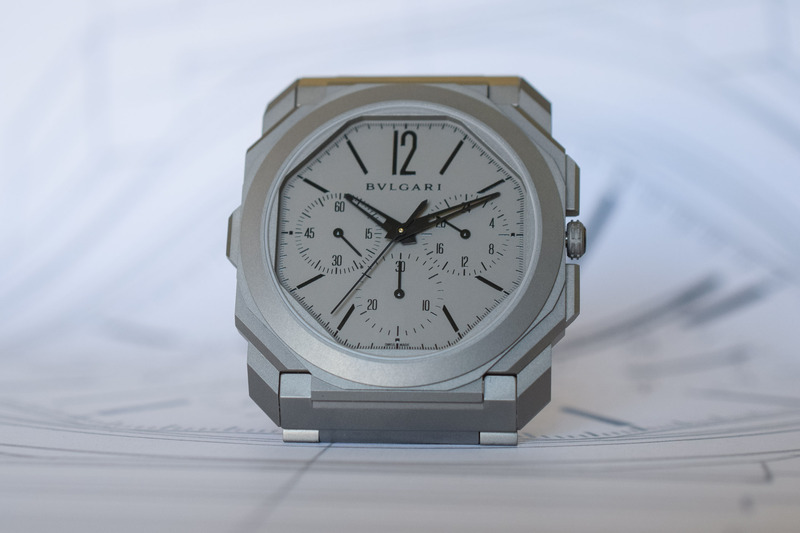 For Baselworld 2019, Bvlgari sets yet another world record – the fifth to be precise. Please welcome the Bvlgari Octo Finissimo Chronograph, with a 6.90mm case and a movement of just 3.30mm, making it the thinnest chronograph in the world – and yes, it is automatic and it features a GMT Complication… No less! 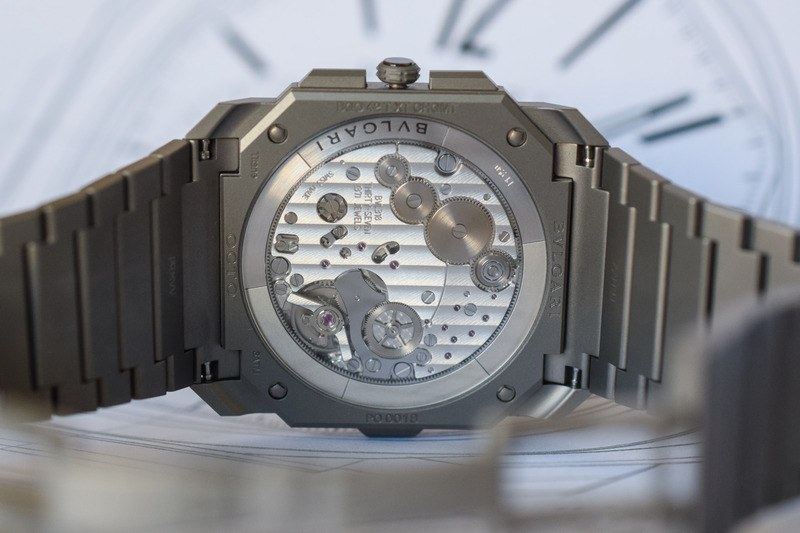 Before moving to the topic of the day, meaning the record for the world’s thinnest chronograph and this new Bvlgari Octo Finissimo Chronograph, a quick reminder of what Bvlgari has done in the field of ultra-thin watchmaking might be useful. 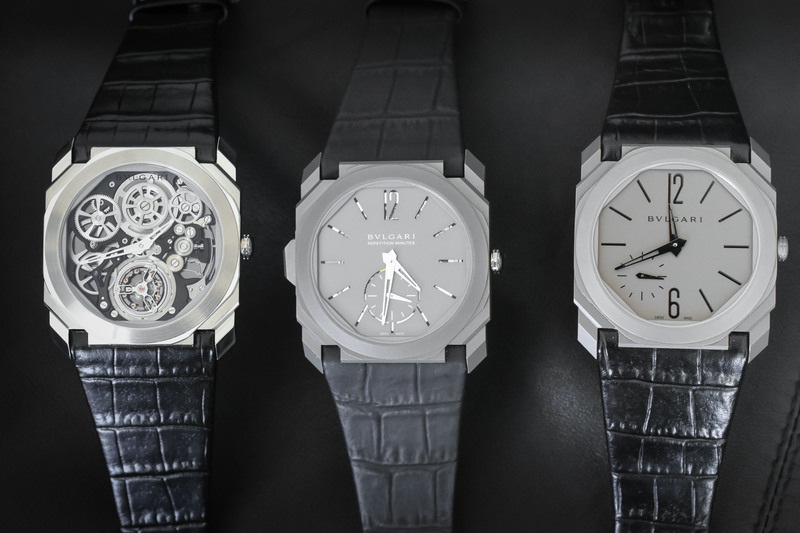 Bvlgari Octo Finissimo Trilogy: tourbillon, minute repeater and automatic. Back in 2014, Bvlgari entered the race for ultra-thin timepieces, starting with a masterpiece, the thinnest tourbillon, also known as the Octo Finissimo Tourbillon and its 5mm thick case and a movement of just 1.95mm. 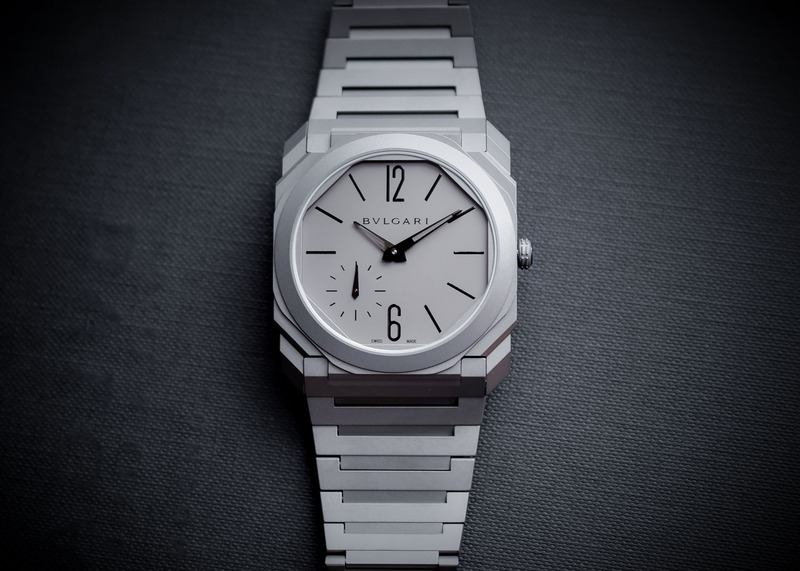 In 2016, thanks to the knowledge gained with the Gérald Genta manufacture, Bvlgari managed to launch the thinnest minute repeater, a watch with a 6.85mm profile and a movement of just 3.12mm. 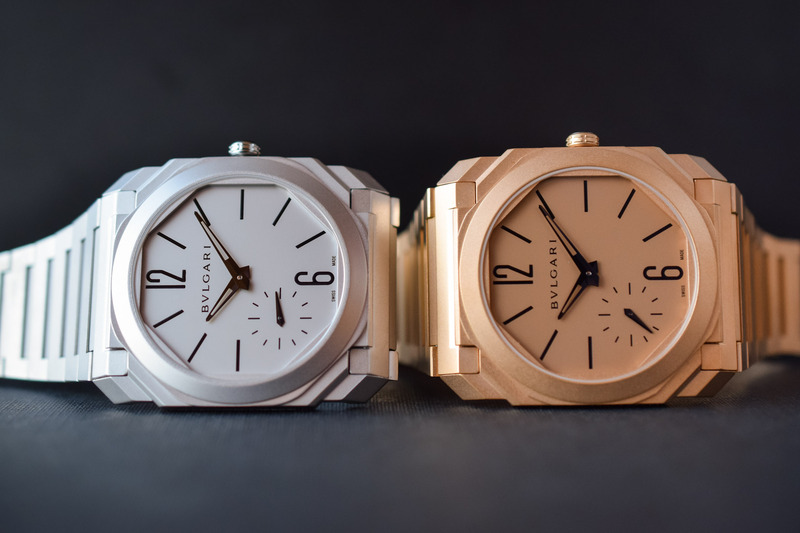 After these complication watches, Bvlgari moved to more accessible pieces and launched the Octo Finissimo Automatic, the thinnest automatic watch (for a few months, as Piaget came our with 910P later in 2017), a 3-hand automatic watch of 5.15mm thick and a movement of 2.23mm. Finally, last year at Baselworld 2018, the Roman brand launched the impressive, modern Octo Finissimo Automatic Tourbillon, the world’s thinnest automatic watch and tourbillon watch ever created – with a paper-thin 3.95mm case and a 1.95mm movement with a peripheral rotor. 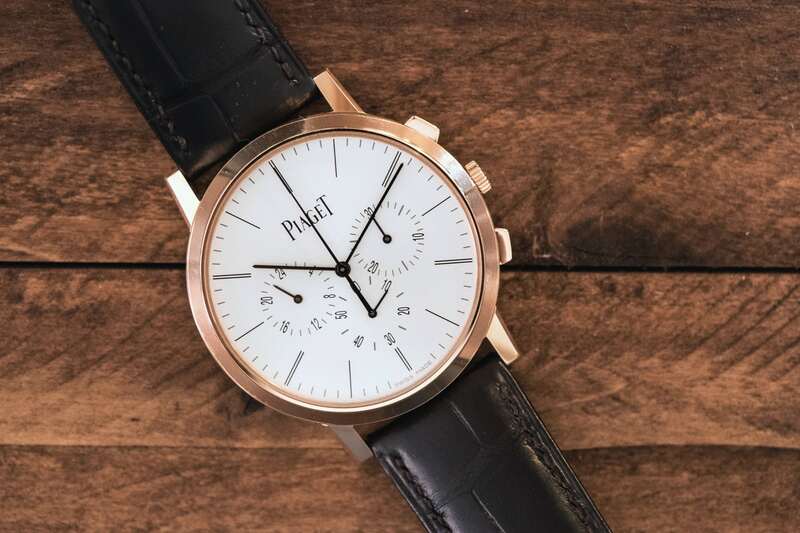 The record for the thinnest mechanical watch remains in the hands of Piaget, with the Altiplano Ultimate Concept and its 2mm thin case – however, it has not been commercialized. 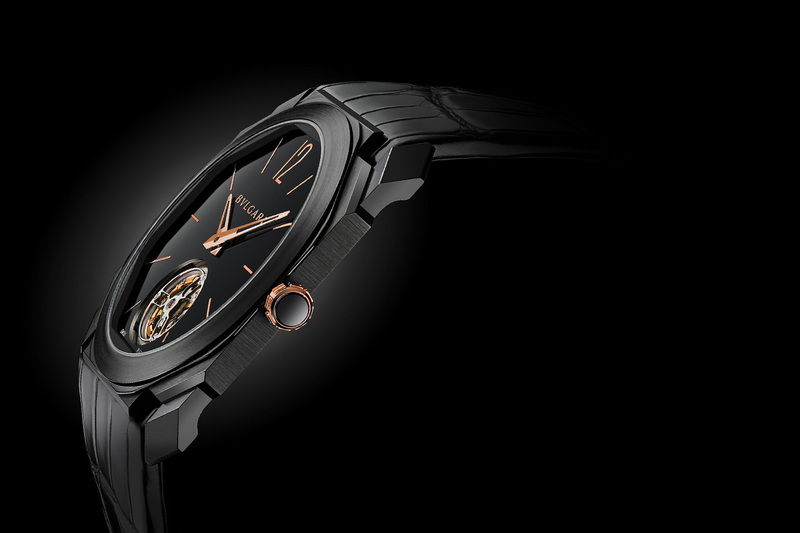 Bvlgari Octo Finissimo Tourbillon Automatic, the World’s Thinnest Automatic Watch and Tourbillon. The development of ultra-thin chronograph complications had been dormant for many years. Ultra-thin chronographs have never been popular, for multiple reasons. 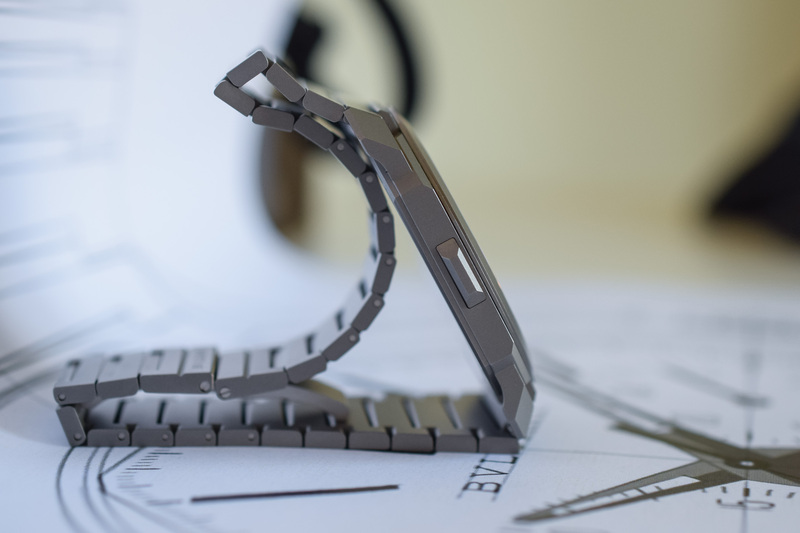 In the first place, a chronograph requires many parts and needs space and is extremely complex to develop – hence the reason why so many brands rely on Valjoux or ETA. And if a brand develops a movement internally, thinness is rarely the goal. 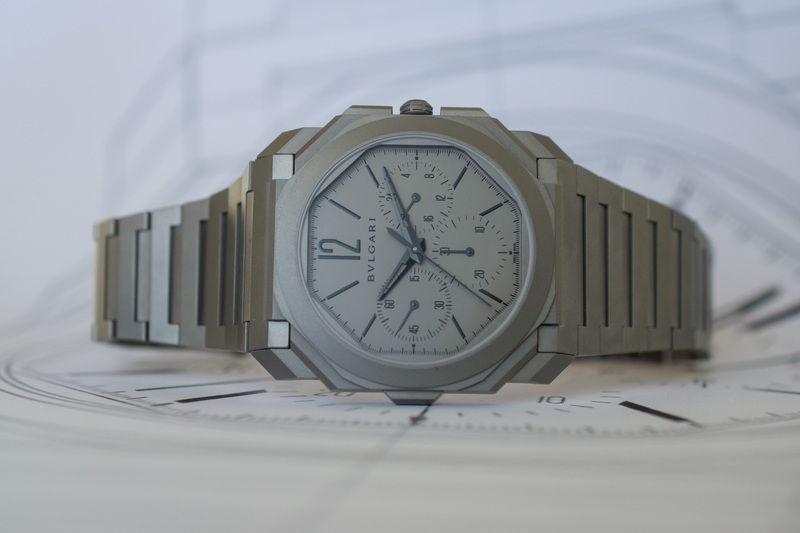 This is why the thinnest mechanical chronograph had been the Piguet 1180, a 3.95mm thick hand-wound movement presented in 1987 – which is the hand-wound version of the well-known automatic calibre 1185. The Piaget Altiplano Chronograph With Caliber 883P – Image by Hodinkee. It wasn’t until 2015 that Piaget embraced the chronograph complication and launched the Altiplano Chronograph Flyback with hand-wound calibre 883P. With its thickness of 8.24mm, it is (in fact, it was) the thinnest chronograph available on the market. Yet, its 4.65mm-thick movement wasn’t the thinnest ever created. However, keep in mind that it has a column wheel architecture and it features a flyback and a GMT function. Not bad at all. However, there’s a new contender on the block: the Octo Finissimo Chronograph GMT Automatic. Without minimizing Bvlgari’s achievement with this new ultra-thin chronograph – it is objectively staggering – this new watch comes as a half-surprise. It was just a matter of time for Bvlgari to embrace the chronograph complication and to offer yet another record-breaking thin watch. 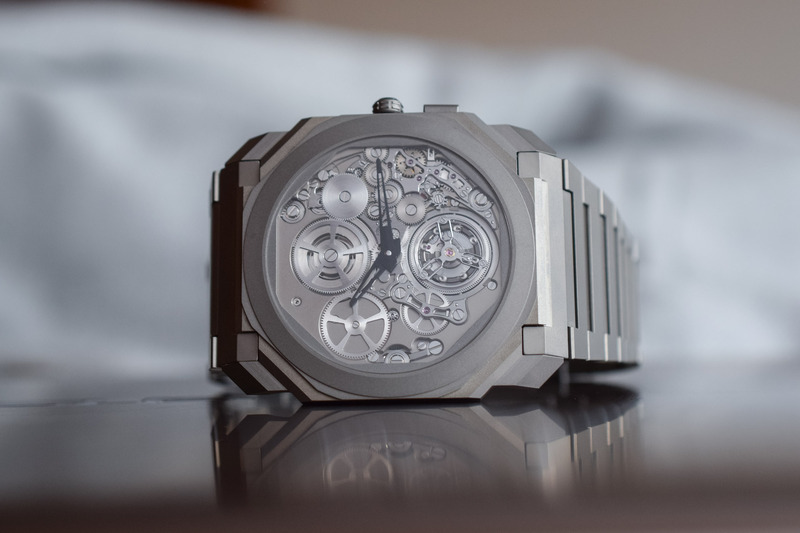 What is more impressive isn’t the record itself, but the margin between the previous watch and this one… We’re talking about a reduction of 1.34mm compared to the already impressive dimensions of the Piaget. To add to the achievement, Bvlgari not only has the thinnest chronograph watch but also the thinnest chronograph movement, whether hand-wound or automatic. 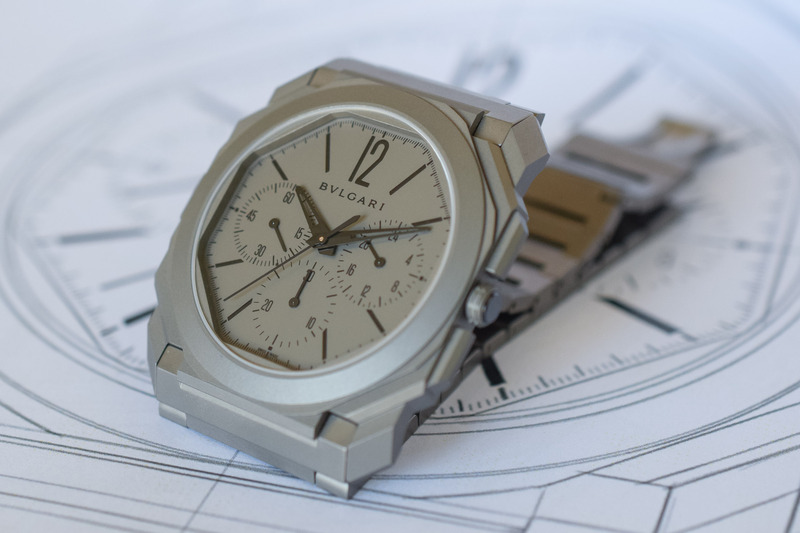 The base of the new Bvlgari Octo Finissimo Chronograph GMT Automatic is well-known now, and the recipe is basically the same as what was used on the 2017 automatic model. Design-wise, this new chronograph version is entirely in line with the rest of the Octo Finissimo watches, confirming the brand’s decision to create an entire collection of ultra-thin watches. 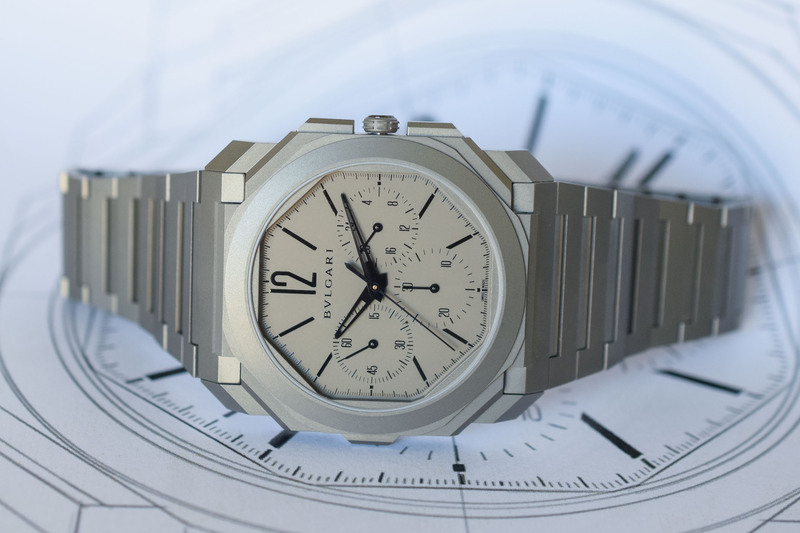 The case of the Octo Finissimo Chronograph features the sharp, modern and original design of the other models, with multiple facets and angles – and overall, a watch that can be described as a luxury sports watch. 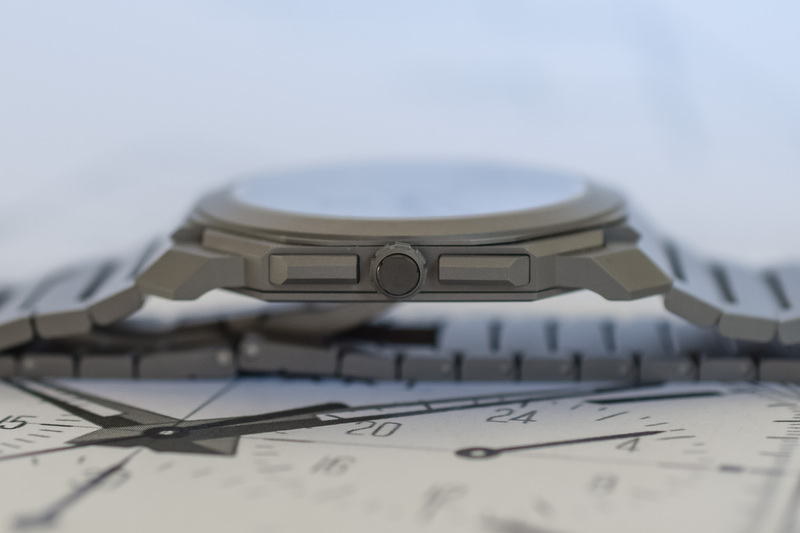 The 42mm case (an increase of 2mm compared to the automatic model) is still fashioned out of sandblasted titanium, giving it a sleek, stealth look with a monochromatic, matte rendering. 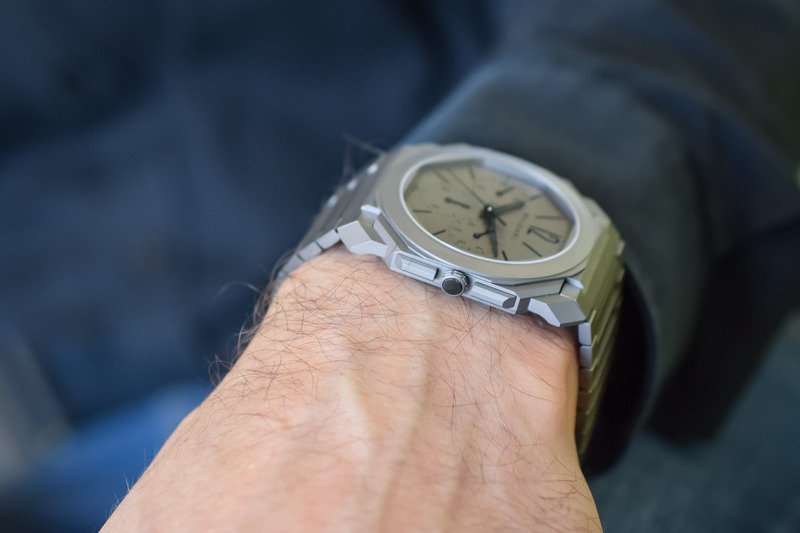 It is, for the moment, only available in this material, with an integrated titanium bracelet. Steel and gold options, as well as leather straps, will certainly follow later. The case, due to the extreme thinness, is only water-resistant to 30 metres. As with the rest of the collection, the case is extremely light on the wrist creating the rather unusual impression of not wearing a watch. 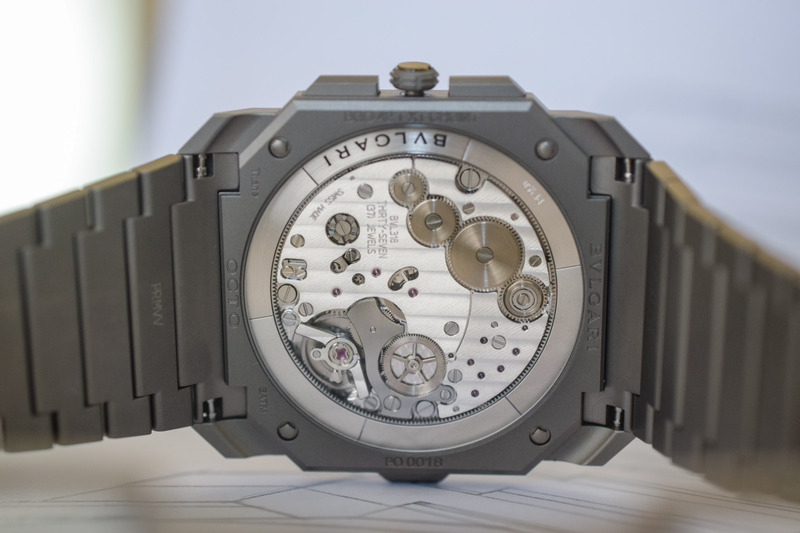 With the addition of a chronograph function, the case has two extra pushers on the right side (classically positioned) for the start-stop-reset functions. Also, as you might have noticed, there’s a third pusher located at 9 o’clock, which serves for the adjustment of the local time zone (the main, central hour hand) by one-hour increments. When pulling the crown, both the second time zone (home time) and the central hour hand (local time) are adjusted. As for the dial, the Octo Finissimo Chronograph GMT Automatic sticks to the codes of its family DNA, with a solid sandblasted titanium dial and black inscriptions, markers and hands. No surprise either in the way the chronograph is displayed. Ultra-thin doesn’t mean a lack of legibility. Indications are naturally positioned, with hours and minutes in the centre, small seconds at 9 o’clock, central chronograph hand, 30-minute counter at 6 o’clock and second time zone at 3 o’clock – a nice addition, the GMT complication certainly is the most practical feature of a modern watch. Let’s now move to record-breaking elements. With a height of just 6.90mm, the case of the Bvlgari Octo Finissimo Chronograph GMT Automatic is the thinnest ever for a chronograph. It is classically constructed, with a bezel, a sapphire crystal on top and a see-through caseback. This ultra-thin achievement is mainly due to the development of the automatic calibre BVL 318, with a staggering 3.30mm profile. To achieve such thinness, the movement is wound by a peripheral rotor rather than a centrally mounted oscillating weight or a micro-rotor – two solutions that inevitably add thickness. Being positioned peripherally, the automatic winding doesn’t add a single millimetre to the movement. In addition to that, the large diameter of the movement (37.2mm, compared to, for instance, 30mm on a 7750) participates in the thinness of the engine – more space horizontally means less thickness on a vertical plane. Concerning the chronograph itself, Bvlgari went for a rather classical architecture with a column wheel and horizontal clutch – the satin-finished part on the movement, above the balance wheel, which is way thinner than a more modern vertical clutch (even though a technically more advanced construction). Even though extremely thin, the BVL 318 calibre remains modern and powerful, with a 4Hz frequency and a comfortable 55-hour power reserve. Finishing is typical Bvlgari, with thin Geneva stripes and machined bevelled bridges. The view through the caseback is pleasant, thanks to the peripheral rotor that doesn’t hide the movement. 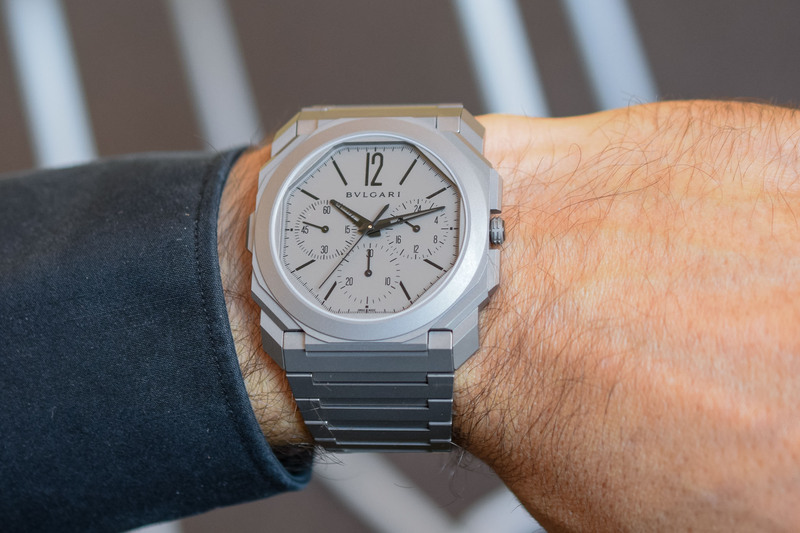 Overall, this Baselworld 2019 Bvlgari Octo Finissimo Chronograph GMT Automatic is another impressive development by the Roman brand, which confirms its supremacy in the field of ultra-thin. Apart from the thinnest mechanical watch and the thinnest perpetual calendar, there are not many thinness records that don’t belong to Bvlgari… The Octo Finissimo Chronograph GMT Automatic will be priced at CHF 16,500. More details at www.bulgari.com. I’m always partial travel time complication and to have Bulgari come out with Octo that contains both GMT and chronograph in a package thinner than even extra thin time only automatic is nothing short of impressive. The only thing I wish they could’ve done is to make it 40mm since the Octo wears bigger than its size.